The Bariatric Folding Walker is used to aid people that have trouble getting around easily. The Bariatric Folding Walker is also easily folded for storage. 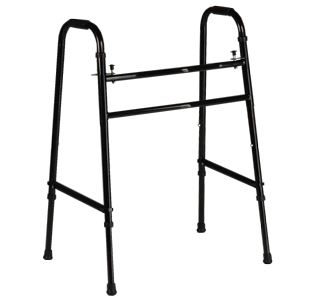 This heavy-duty walker can support users who weigh up to 600 lbs. Over the toilet design - angled front legs to insure stability. Double tube cross brace, side leg braces with patented brace clamps for added safety. Adjustable in 1" (2.5cm) increments. Recommended weight capacity: 600 lbs. Width at base filly extended 26"